Three architect installations unveiled for Tides and Times – a BBC21CC and RIBA London celebration of the river Thames and the cultural institutions along its banks. On 16 July, BBC 21CC and RIBA London will launch an ambitious multi-media educational project celebrating the river Thames. Featuring audio-visual pods by high-profile architects, Tides and Times explores the historical, ecological, geographical and social elements of what makes the river special and such an iconic image of London. RIBA London appointed four architect teams to work with primary school children to design the audio-visual pods at Somerset House, the Southbank Centre and Southwark Cathedral, as well as a connecting walking route along the Thames. These pods will showcase the children’s multimedia content for the duration of the summer (16 July – 13 September). Each pod is completely unique. The architects’ design process has been guided by the workshops with the children and the results are starkly different. The pods will be open to the public and free of charge 16th July- 13 September. 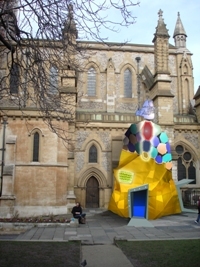 You can find out more on the RIBA Tide and Times webpage and the BBC 21cc website.